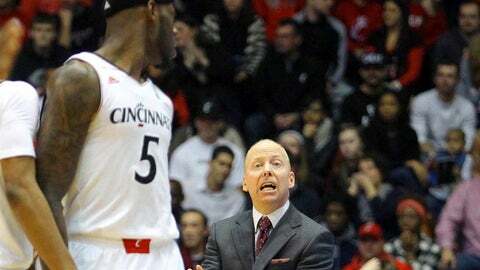 Cincinnati Bearcats head coach Mick Cronin relays a message to forward Justin Jackson (5) during the first half of the game against the Central Florida Knights at Fifth Third Arena. CINCINNATI — There isn’t a pretty thing about the Cincinnati Bearcats basketball team. That’s the beauty of it. UC won its 11th straight game Thursday night, beating Central Florida 69-51 in a fashion that is beginning to become routine. The 15th-ranked Bearcats fell behind early before taking a halftime lead and then controlling the second half to earn the win. They are 18-2 now and a perfect 7-0 in the American Athletic Conference, although they are hardly perfect. That’s no problem for Mick Cronin. It just allows him to keep teaching and finding ways to motivate his players. Like telling them that one loss will drop them from the national rankings. "We know that coming in," said forward Justin Jackson. "They don’t love us," said guard Sean Kilpatrick. UC opened up the second half with an 18-5 run over the first five minutes to essentially put the game away against one of the AAC’s cellar dwellers. UCF (9-8, 1-5) lost its fourth straight game and became the 27th consecutive opponent that failed to reach 70 points against the Bearcats. Yet Cronin was using every available opportunity he had to get something better out of his players. It’s because he knows there is more to get from them. "I thought we got a little sloppy in the first half," said Cronin. "We’ve got to continue to improve and get hungry to play great collectively and individually for 40 minutes to get where we want to go and accomplish what we want to accomplish." UC has not trailed at halftime during this 11-game winning streak and has led at the intermission in its last nine games. Only twice, however, has it had a double-digit lead – 19 points against Chicago St. and 16 points at Houston – and six times the lead has been no more than four points. It was just three points against UCF, 30-27, after the Bearcats built as much as a nine-point advantage. The Bearcats committed eight turnovers and was just 13-of-31 from the field in the first half. "We were sleepwalking," said Jackson. "Everyone from the coaches through the bench, everybody was sleepwalking and we knew that. We came in at half talking about the first half is over, itâs time to buckle down and get the W."
Jackson did his part to wake up his teammates and the crowd of 10,242 at Fifth Third Arena with 12 points, four steals and equaling his career high of seven blocked shots. He rejected UCF forward Staphon Blair as Blair went up to dunk the ball on a baseline move with 13:27 left. Blair, at 6-9, 250, is physically bigger than Jackson but that’s of little consequence to Jackson. "I said ‘Like, really? You’re going to do that?’ And I blocked it," said Jackson. "I felt disrespected." The student sections on both ends of the court serenaded Jackson by chanting his name. As deserved as that was, Cronin still found some lulls from the team he didn’t like. UC led by as many as 20 points in the second half but Cronin called timeout with 6:47 left when UCF got to within 13 points. "I just thought we were ready to go get some pizza, where I want them to want to go up 40," said Cronin. "It’s just the mentality. You have to really guard against complacency when youâre winning as a coach." UC’s next two games are on the road; at Temple on Sunday and then at No. 12 Louisville next Thursday night. The Bearcats beat Temple by 11 points at home last week after leading by two points at halftime and trailing by two points with less than seven minutes to play. Louisville is the defending national champion and is one game behind UC in the AAC standings. "For us it’s not about where you’re at, it’s where you’re going," said Cronin. "Sometimes you have to coach harder when you’re winning. When you’re losing or you have a tough loss, if your team is really worth their salt you really don’t have to motivate them. "We have things we want to accomplish and to get there we’re going to have to play better. It can’t be just about ‘Well, we won.’ I’m trying to get us away from that. I’m trying to get us to play great for 40 minutes. The day could be coming Sunday at Temple that if we don’t do that we could lose."